started as individual requests from clients. These ink maps are highly customizable, and fall in many categories. Below is an example of just a few options you have for custom map work. with print purchases taking place separately, after the project's completion. At the bottom of this page are some maps that were commissioned by some awesome collectors. Scroll through them to get your inspiration flowing. I 'm looking forward to creating something with you! What best describes the map you are interested in commissioning? To see examples of these categories, go to the bottom of the page. Do you know what size you want? This helps us estimate print cost. In most cases, you can change the size once the painting is completed, prior to purchasing the print. If you know the sizes you are wanting, let me know that here. Also share anything else that would help me grasp the vision you have for this custom piece. I will look over your request and get back to you soon! This is an example of a standard commissioned topography painting. The client had lived in many places around the US and the world, and wanted a painting of each location. These colors are inspired directly from satellite images, and the topography is based off of maps of the area. Paintings such as these are incredibly accurate, and perfect for collections, etc. As all of the United States have already been completed in this style, these commissions are most popular for other countries and provinces. Speaking of the United States, since they have all been painted, getting a custom mosaic of a cluster of states is easy-as-pie. These have a smaller commission fee, and are really pieces for people who have lived in many states, or have family spread out. Mosaics work best if the states border each other in some way. Can you tell your story in a state mosaic? Completed for a client traveling to Greece, this piece did not need to boast accurate topography. Instead, it's goal was to capture the feeling of the location, whilst keeping the outline of the country (with all of its islands) intact. To show the scope of variety available in these paintings, this is another in the Abstract Country Silhouette category. This client's husband mines fire opals in Australia, and thus she wanted to commission a piece for him that mimicked the colors and textures of those gemstones. The topography in this piece is not accurate, but the focus was the outer shape, and the imitation of this incredible stone. It was placed on a black background to make it really pop. This client wanted a map of the area around their home, but they wanted the focus to be on the water depths mostly, with hints at the land topography. The land is inked in a gold and cream color scheme, but keeps its accuracy relatively intact.. This color scheme, being more neutral, allowed the bodies of water to really pop. As the topography is still correct, the client can name every river and lake, but it still feels abstract, and loose. 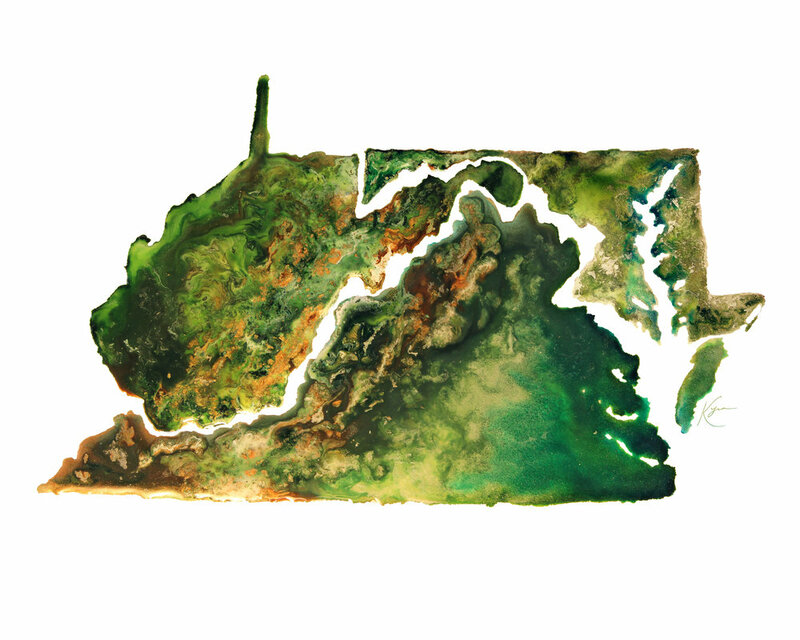 For this commissioned piece, the client had family all the way up the eastern shore of the United States. She wanted to "bring them together" in one piece that would represent all of their homes. The focus for this piece was the shorelines and the water, with no emphasis on the land topography.